Your serving sizes of foods and the official serving sizes are probably two different things. It may be the perceived size of a serving that causes you to be gaining weight. I know this is an area where I tend to cheat myself. Here is how it works with me....You first hear about how you need protein to build muscle then You need whole grains that is good for your heart and avocado has vitamin E and fish for the omega 3s...As I eat these foods I feel good about them and keep on eating.....surely more must be better.....then I gain weight and wonder why. Does this sound familiar? The objects to the left are to help you quess the serving sizes of various types of food. These are the suggestion of the Mayo Clinic Diet, and follow the quidelines of their pyramid which encourages you to eat more fruits and vegetables. Just be careful because some vegetables like beans potatoes and some peas are concidered starches and require smaller and fewer servings. 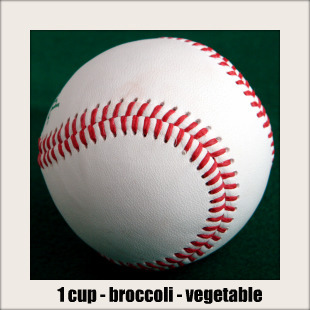 To help you remember what a one cup serving of green or leafy vegetables looks like, keep in mind a baseball. Fruits have a few more calories and are loaded with vitamins so a half cup of fruit is sufficient. 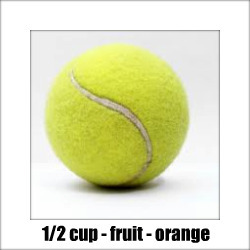 A tennis ball is about the size of an orange. We have all heard that whole grains are good for you, but you only need a few small one half cup serving. 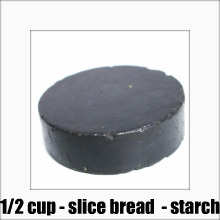 You could think about the tennis ball for a small potatoe, but for something like rice or a slice of bread think about a hockey puck. 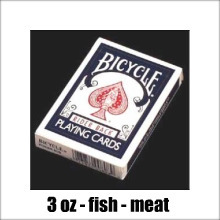 One or two servings of meat the size of a deck of cards is enough for the day. This would be about 2.5 or 3 ounces. 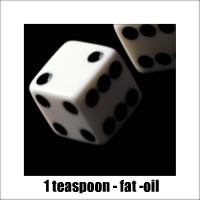 And a serving of fat would be about the size of one die. For peanut butter which is about half fat, two dice is ok.
Time to get out the scales and measuring cups. I particularly like our metal measuring cups that have handles because they double as serving spoons. For a week or at least several days, measure everything to get used to what serving sizes of food should look like. Now you are ready to estimate. Here are the most common cues used to remind you. Now think you know how to estimate serving sizes of foods? Test to see how close you are. Take the food off your plate every now and then to see how close you are. I am not very good. Sometimes my servings sizes are two times what they should be. If you are off, go back to measuring for a couple of days. The other problem that may be causing you to gain weight is knowing how many servings of fruits and vegetables a day to eat.